In 1816, an organ built by Thomas Elliott, of London was presented by King George III to the “new” Christ Church located on Notre-Dame Street in the old city. Dubbed “the King’s Organ,” this instrument, along with the church, was totally destroyed by fire in 1856. William Hill and Son, of London, built a new mechanical action organ that was an “exact replica” of the “King’s Organ” which was placed in the North Choir aisle. During the next 120 years, this organ was enlarged, rebuilt, and moved on numerous occasions. 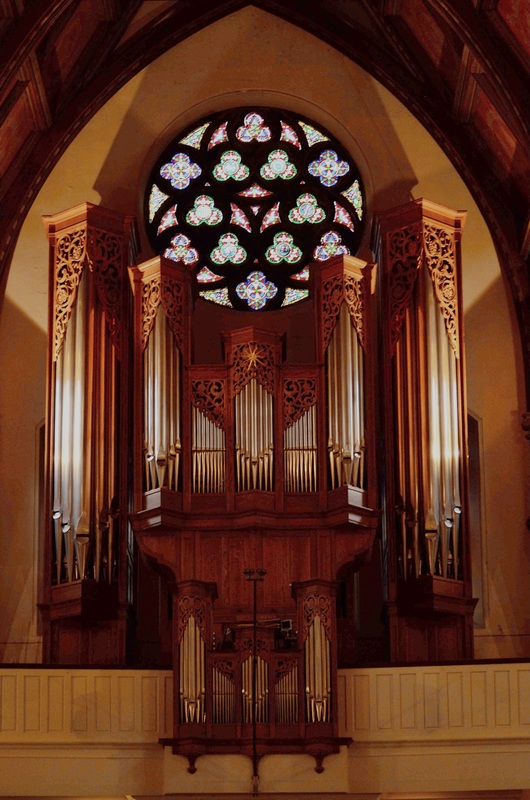 In 1979, the congregation decided to commission a new organ in a new gallery with mechanical key action to be built on the principles of the great organs found in Protestant churches of northern Europe. The 3rd Cathedral organ was installed in 1980, in a new organ loft over the West Door. The mechanical action organ was designed and built by Karl Wilhelm Inc., of Mont-St-Hilaire, Québec. The organ comprises four manual divisions played from three keyboards and a pedal division, 43 stops, and 63 ranks, with a total of 2,778 pipes. In 1992, a new 32′ bombarde was added to the pedal division. The organ features suspended key action and mechanical stop action, with principal pipes made of 75% polished tin. The flute pipes are of hammered tin-lead alloy; the sharps, of ebony, and the natural keys are covered with bone. The casework is crafted of solid white oak, and the pipe shades are hand-carved of butternut wood. Hans-Üli Metzler of Zurich, Switzerland, was the consultant and set the tonal structure of the organ. The voicing was done by Jacques L’Italien and Karl Wilhelm. The inaugural concert was given by Mireille and Bernard Lagacé on January 24, 1981.